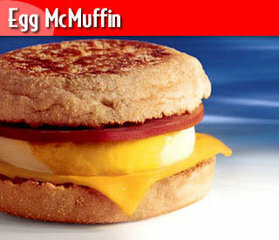 Blog The Egg McMuffin Reaches Its Midlife Crisis? The Egg McMuffin Reaches Its Midlife Crisis? At first, it was quite a feat in itself to get people to go to a fast-food chain in the morning – the reason for a number of ads ranging from nostalgic and tearful to downright creepy (well, yeah, there’s usually something unsettling about 70’s commercials). The 40-year birthday of the Egg McMuffin has been marked with the new version of the breakfast classic. A healthier, less guilt-ridden version called the Egg White Delight McMuffin. The egg yolks have been removed, the glow-in-the-dark cheese has been substituted for a white American one – and that’s pretty much it. While it does cut the cholesterol in the sandwich by 90%, is it still as good? Well, reviews have been mixed, ranging from ‘quite tasty’ to ‘not the greatest thing’. I’ve never really understood why you would go to McDonalds if you’re trying to lead a healthy lifestyle, but there are (possibly) millions of people that do, so yeah, it’s probably a good choice for them. Still, even in the beauty shots, the new muffin looks plain, dry and not mouth-watering at all – not something you’d want to start your day with. Is it the midlife crisis of the Egg McMuffin? It’s possible – let’s just hope that it gets through it without becoming the Egg White Vegan Bean Chili Sports Cabriolet McMuffin. Or something entirely too trendy.